(Culpeper Star-Exponent) A new chapter opened in the journey of the grave marker of infant Johanes Walk as Town Public Works Director Jim Hoy passed the stone on to the Germanna Foundation during a brief ceremony at the Brawdus Martin Germanna Center in Locust Grove Friday afternoon. The marker was the original gravestone for Johanes Walk, a six-month-old great grandson of Germanna colony settler Michael Clore. The marker was originally located in the Freebird Moravian God’s Acre Cemetery in Winston-Salem, North Carolina. The marker was found in an antique shop in Fredericksburg and purchased some 30 years ago by former Culpeper resident James Lee Lloyd, who left it in a field belonging to the Southridge Village and Town Homes subdivision in October when he moved to Arizona. It was discovered there last December by a crew cleaning up the site. The subdivision home owners association brought the marker to the attention of the town. The Memorial Foundation of the Germanna Colonies in Virginia, Inc. President Marc Wheat said the Foundation is grateful to have the marker and will work to return it to its proper place in North Carolina. “We’d like to invite some members of the Moravian community to come by in July for a public event where we can turn the stone over to them,” Wheat said. Wheat said it was fitting the stone turned up on property formerly belonging to the late J. Carlton “Zeus” Clore, himself a descendant of the Germanna colony’s Michael Clore and a distant relative of Johanes Walk. In fact, Walk is related to more than half the Foundation members, Wheat said. According to Cathi Clore Frost, of Oregon, a trustee of the Foundation and also a relative of the Clore colonists, the No. 2 on the marker means that the infant was the second person interred at the Moravian Cemetery. Frost said the Walks were descended from settlers who traveled west from the Germanna colony toward the Blue Ridge mountains, before turning south to settle areas of North Carolina, where land was less expensive. During the ceremony, Wheat thanked the town for bringing the marker to the Foundation, and said the Foundation will continue to seek the stone’s proper current owners. 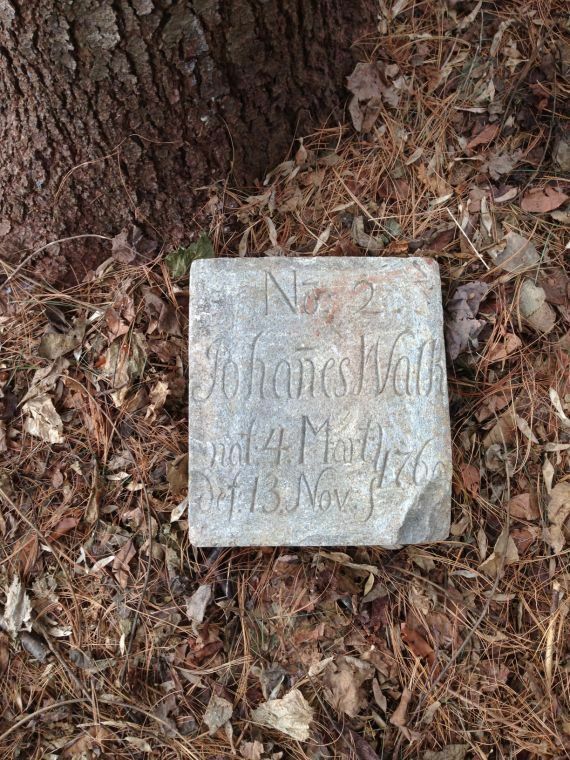 “We are just so grateful to Jim Hoy and the Town of Culpeper and the Southridge Home Owners Association for finding this gravestone of Johanes Walk,” Wheat said. “It just goes to show you never know where history will turn up,” he said.